Chelmsford Public Library is committed to making library services accessible for all our users. The Main Library is fully handicapped-accessible. This includes access to all areas of the building, and all collections and resources. Staff is available for assistance in accessing any of MacKay’s other collections. A low-vision computer with high-visibility/low-mobility keyboard is available in the Large Print Room. An Optelec magnifier is also available in the Large Print room. A public videophone is available for use in the library by any deaf or hearing-impaired person who speaks sign language and needs to make a phone call. 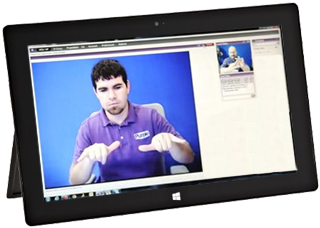 The videophone is powered by Purple, an assistive technology that makes the phone call via video relay service, which gives the caller an on-screen sign language interpreter. A Purple account is not required in order to use the public videophone, can be used to call any phone number, and the device may be used free of charge. The videophone is available by request at the reference desk on the lower level of the library. It is not necessary to have a library card to use the videophone, but staff will hold your photo ID at the desk while the device is in use. OverDrive for Android, iOS (iPhone/iPad/iPod touch), and Windows is compatible with most accessibility programs and apps (including native ones like TalkBack, VoiceOver, and Narrator). Talkback: Android/iPhone – TalkBack adds spoken, audible, and vibration feedback to your device. TalkBack comes pre-installed on most Android devices. To turn on the accessibility shortcut on your device’s Settings app, open Accessibility, then Accessibility shortcut or Volume key shortcut. At the top, turn on Accessibility shortcut or Volume key shortcut. VoiceOver: iPhone – VoiceOver is a gesture-based screen reader. Hear a description of everything happening on your screen, from battery level to who’s calling to which app your finger is on. To turn on the feature, access Settings, then General then Accessibility. Narrator: Windows 10 – A light-duty screen reader utility. It reads dialog boxes, windows controls, apps, and webpages. To start, tap the Search button on the taskbar, enter narrator in the empty box, then click Narrator in the results. Northeast Independent Living Program: Provides independent living services for people with disabilities. Massachusetts Office on Disability: State agency whose primary mission is to assure access to state and local programs, activities, and services for people with disabilities. Massachusetts Rehabilitation Commission: State agency responsible for Vocational Rehabilitation Services and eligibility determination for the Social Security Disability Insurance (SSDI) and the Supplemental Security Income (SSI) federal benefits programs. DisabilityInfo: Index of services and resources for people with disabilities in Massachusetts, searchable by disability or location. New England ADA Center: Provides information, guidance and training on the Americans with Disabilities Act (ADA), tailored to meet the needs of business, government and individuals at local, regional and national levels. Perkins in Watertown MA: Organization committed to improving the lives of people with blindness and deafblindness. Includes Perkins School for the Blind and the Perkins Library, which circulates items in braille, audio, electronic, and large print formats. Disability Law Center: Protection and advocacy agency for the rights of Massachusetts residents with disabilities. National Library Service: NLS is a free braille and talking book library service for people with temporary or permanent low vision, blindness, or a physical disability that prevents them from reading or holding the printed page. Through a national network of cooperating libraries, NLS circulates books and magazines in braille or audio formats, delivered by postage-free mail or instantly downloadable. Uses BARD: Talking Book Topics lists the audio books and magazines added to the NLS collection within the last two months and available through a network of cooperating libraries.